Laying It On The Line In 2009! 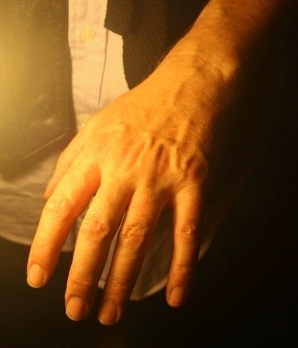 These fingers make notes. Sometimes. During 2009, Billy was interviewed by Newcastle based musician and academic Andrew Simmons for a research project Mr Simmons is writing for his B.Mus. (Hons) degree. Was performance of original material always your career plan? Do you - or did you feel it was compulsory to - have some form of formal musical training to get you to the level you are today? I had elementary classical lesson and only got as far as Grade 1 distinction on violin & Grade 3 viola. But in hindsight I had a superb choir master, Michael Bailey, at the local parish church aged 10-12 years old. Did you require some form of start-up funding? i.e. savings, arts council funding, etc. That didn’t exist for a 14 year old in 1970…..
What obstacles did you face in getting to the stage in your career you are today? How did you solve them? The record industry is dying. So I have gone where the smart money is and I am conducting Humanist funerals. An absolute avant garde gig……. 37 years a bandleader has worn me out. There is just not the venues that can pay enough to pay musicians a just fee…..£75 a bed in a hotel x 5 = £375 for starters…. petrol…. even just £100 a man - you need £1,000 a show minimum…..flights are b*****ks - prompters pay for cheap airlines but you end up either paying almost as much for ‘excess baggage’ or instruments or they refuse to let you take hand luggage small instruments on board. 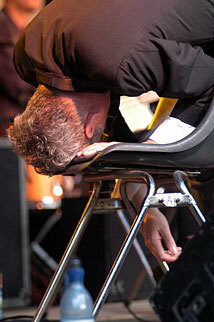 It’s worn me out…..
How do you currently book gigs? e.g. self-promotion, agency, etc. Where and how do you advertise your act? Which do you consider to be the most effective medium? Can’t afford to and it’s too time consuming to address the fast diluting effects of web based commerce. [How] do you use Internet technologies to promote your act or keep your fan base up-to-date? I don’t do email shots as we all get too much shite thrown at us. Too much time in front of PC hurts my hands (I have mild carpal tunnel), neck, eyes and brain. Social network sites too time consuming but I do have a MySpace and here at www.billyjenkins.com. What do you do to stay ahead of your competition (similar acts)? How important do you consider having a unique selling point? The unique selling point is being unique. And being fantastic. And that takes years of serious study and experiences. I’ve had about 40 albums released. Tons of critical praise and media soundbites. Those who stay ahead of competition invest heavily in PR and promo. When Jamie Cullum was doing the business, he had two people working fulltime on his MySpace site……. Are you set up as a sole trader or limited company? How is your revenue budgeted to pay expenses? i.e. travel, accommodation, hiring musicians, etc. No pay - no play. I’ve been trying to pay tax for years….I WANT to pay tax. To feel that I am contributing to the infrastructure of our country. Do you take care of your own admin? i.e. tax rebates, PAT testing, public liability insurance, etc. Yes and my wife does my books. Is it difficult to find time to expand your repertoire/practice on your instrument? You bet - it hurts my hands anyway - I can only do half an hour at a time and why expand if there is no one who wants to hear what you do? Too much time on admin and addressing ever changing and complex copyright laws. What led you to the genre you are in? e.g. prospective profits, artist license, etc. The Muse…..The joy of making music with other people……. In what ways do you copyright your material? How much does it cost to do so? Have you had to deal with copyright issues? PRS/MCPS. Obviously copyright protection is vital and with over 350 works registered with PRS since 1975 (I think) I have to protect my meagre returns for my children’s benefit…..It’s an amazing situation now. You can download some of my albums in USA for free - and I’m just a diddly-squat artist in the grand scheme…. Spotify - Ha! I just took a line out the headphone socket and recorded straight onto Mini disc……my children’s generation have decided recorded music is for free….we are all DOOMMMEDDD! But at least we ALL are…! Artistically, is your line of work fulfilling? It’s all I’ve ever done and it is what I am. Conducting Humanist funerals is a natural extension of performance, spontaneity, writing words, creating emphatic verses and phrases, oratory…..and it’s one step on from the blues…. Do you charge a blanket fee for all performances/venues or does it vary accordingly? If you did that, you would never work. All festivals, for example, have a budget cap. If you can help them - they can help you and a few more folks might get a gig too. Jazz clubs - all run on a non profit basis (well most of them). You can’t charge more than each gig can offer…..
Is it the case that performance is, particularly nowadays, more profitable than CD sales? To be frank, for the serious musician, neither are profitable. I can tell you that my last CD release ‘Songs of Praise LIVE!’ released Nov 2007 had superb press and ok national airplay. LAST YEAR I SOLD 25 ALBUMS ONLINE via my site……There are either door money low paid gigs or 500 seat venues. 100 - 200 seat theatres and arts centres are in decline due to reasons stated above. Have technology advances helped or hindered your practice with regards to composing techniques, promotion, performance or sales? Yes and no. I need to devote serious study to addressing the ‘new way’. But it is not what I do. I’m sure there’s a young whizz kid out there who I could employ on a one off basis to address things - but I’ve not started looking, nor have the time or wherewithal to source. But, as a composer, my ears aren’t happy with MP3 - THERE IS NO RETARDATION OF NOTES - IN OTHER WORDS, THE VERY BREATH OF A MUSICAL SOUND IS IGNORED. This works fine for machine made music - but for acoustic , the COMPRESSION reduces the impact. What are the biggest rewards in this line of work? Being honest, open and just being Billy. And going where the Muse takes me. Severe mental and physical collapse in my late 30’s….I still have to be careful. If you knew before you started what you know now, would you have done anything differently? Do you have any advice you could share with composer hoping to perform original material of their own? Make sure you fall mutually in love with someone with a disposable income…..